I love the water. I love swimming, snorkeling, board sports, and boating. I also like to experience nature - the more unusual the sighting, the better. So I was pretty excited when my mom told me that we’d be going on a cruise with UnCruise Adventures to the Sea of Cortez in Mexico. I was even more stoked when I discovered that we’d have the opportunity to swim with giant whale sharks! Read on! KidTripster Tip: Know that UnCruise cruises are unplugged, meaning there’s no WiFi on the ship. Some teens may complain about this fact, but really, it’s no big deal. There are so many other things to do, you won’t miss it. And if you want, you can always bring a device to play games on, when you have any downtime. The customer service that I experienced on this trip was at a whole different level. The staff was super friendly and easy to talk to. They went out of their way to make sure that you were having the best time possible. 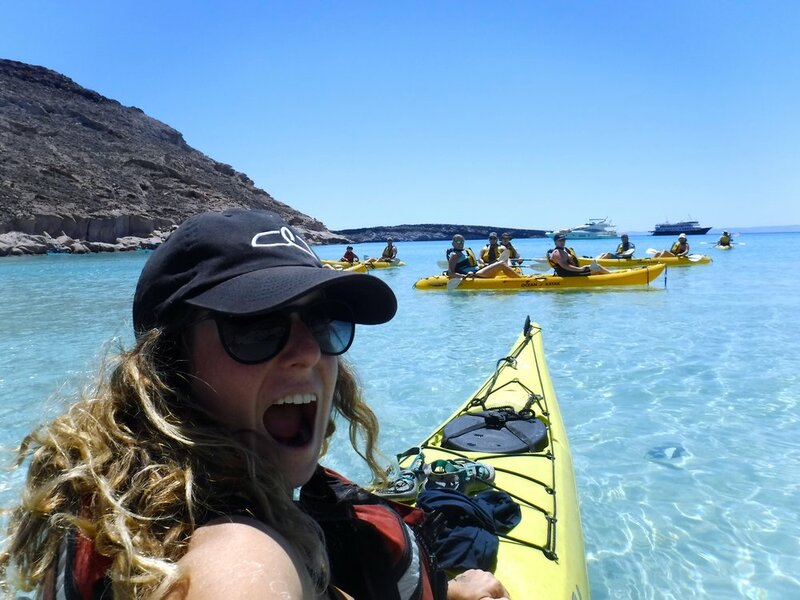 My mom once asked the expeditions leader if she could add a family kayak trip to the itinerary, and she did it without question. And the daily room service was a really nice touch. The steward made your bed in the morning; at night, she did turndown service and left chocolates. I’ve traveled a lot, and this was one of the best customer service experiences that I’ve had. 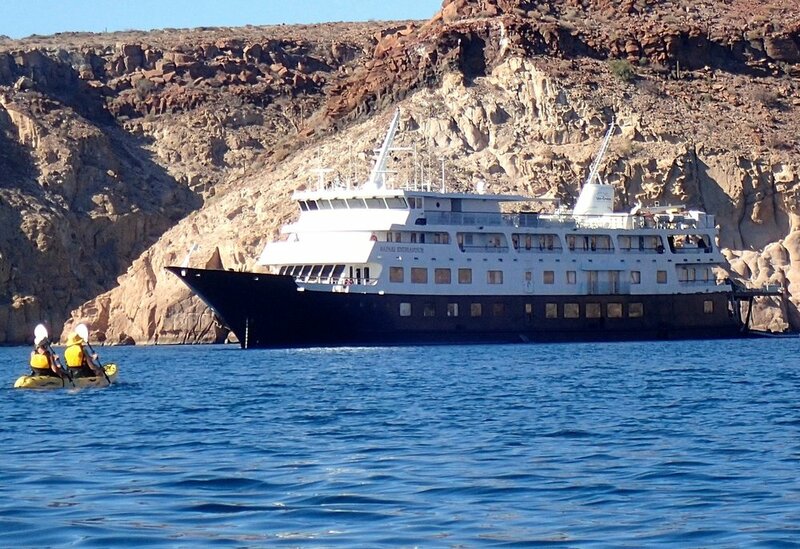 UnCruise's Safari Endeavor was 232-feet long; that’s pretty small compared to traditional cruise ships. But because of its size and the nature of UnCruise, the captain could easily change course. On the first full day at sea, the crew spotted a super pod of dolphins. Instead of following our schedule, we followed the dolphins. The same thing happened days later when we eyed the blow of a humpback whale in the distance. On this cruise ship, there were hot tubs on the stern on the ship. One of my favorite things to do was jump into the hot tub after returning from snorkeling. Most of the time, I had it to myself! Also, there was a variety of exercise equipment - two ellipticals, two stationary bikes, and free weights - on the sun deck. In the morning, the sun desk also was home to the morning yoga class. I didn’t attend, but some kids did. KidTripster Tip: You’re supposed to be at least 12 years old to go to the yoga class, but I’m pretty sure that younger kids could go, if they just asked. Keep in mind, the class starts at 6:45 a.m.! Before anyone freaks out, the ship’s bar served all kinds of drinks, including non-alcoholic ones. I ordered a new drink every day. My favorite was the virgin Piña Colada. My mom was addicted to the morning lattes. The friendly bartenders made drinks all day long - anything that you wanted. If they didn't know how to make a particular drink, they looked it up in a little recipe book. UnCruise had open seating at breakfast, lunch, and dinner. That meant that you could sit with different people every day. Even though there weren’t a lot of kids on our particular cruise, it was fun to talk to older people from around the world. Most of the passengers were from the USA, but there was a couple from Canada and another one from Australia. 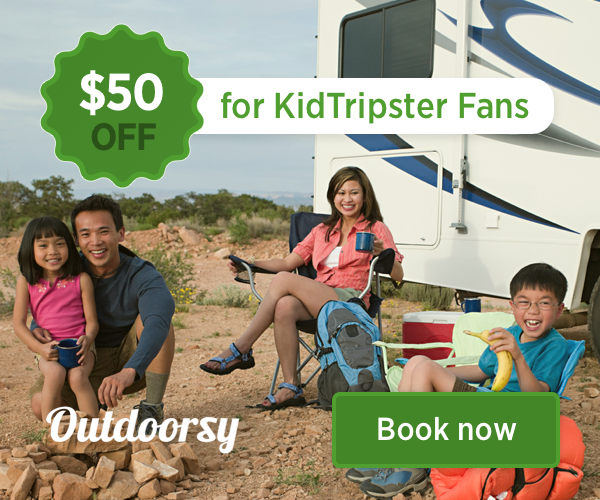 KidTripster Tip: Tables are set for six people. So if you’re a family of four, it’s impossible to sit with another family. There were basically three ways to experience wildlife off of the ship: hike, snorkel or ride in a skiff, a motorized, inflatable boat that holds about 12 people. Whenever possible, my family and I opted to snorkel. Most of the snorkel sites had good water clarity. We saw all sorts of fish: Panamic Sergeant Major, Whitecheek Surgeonfish, Guineafowl Puffers, Reef Cornetfish, Cortez Rainbow Wrasse, and Pacific Creolefish. (Confession: I didn’t know all the names of these fish, but my mom looked them up in the ship’s library.) We also spotted some really bizarre invertebrates, like tube worms. But even better, we got to swim with larger species like California sea lions and whale sharks! Full-grown whale sharks can grow to 60 feet; the ones that we saw were 20-foot adolescents. Still it was very cool! For me, the whale shark swim was the highlight of the trip. Take a look here. The Safari Endeavor had five nature guides on board; they appeared to be in their 20s, and each had either studied marine biology, geology or some related field. They were friendly and answered any question that you had. At night, they gave educational presentations. At first, I didn’t want to go, but the talks were actually pretty interesting. For example, did you know that a pregnant female whale shark can have more than 300 babies inside her, all at different stages of development? Our cruise also had an extra birding expert on board, Juan-Carlos Solis. He loved birds and was really good at spotting and identifying them. Despite all the activities, you did have free time. On the ship, I spent time playing cards with my family, reading, and yes, playing games on my iPad. Off the ship, you could opt for “beach parties,” but they were more like play time than party time. You could take out paddleboards and kayaks. Also, you could bring your snorkel gear (provided by UnCruise) and explore from the beach. My mom wouldn’t get in the water without a wetsuit, but it didn’t bother me. And when you got hungry or thirsty, there were snacks on the beach. It was a pretty awesome way to spend the afternoon. Aidan Shah is an eighth grader living in Portland, Oregon. When he was 10 years old, he traveled around the world, visiting 11 countries in 72 days.